I have been having a very open love affair with bread ever since Celia sent me Cordelia, my sourdough starter. However, when we went to Italy in October I placed my starter into the freezer and I have left it there. I just have not had the time to dedicate to making bread every weekend. Since we got back from Italy I have been watching Paul Hollywood’s program on TV called bread. He has to be one of the most good looking men on TV at the moment, and to top it all, he makes the most divine sounding and looking bread. As he does not give exact quantities on his show I went out and bought his book 100 Great Breads and the first loaf that I made from the book was Tuscan Bread. I needed bread crumbs for a recipe and decided to make this Tuscan bread so that my bread crumbs would be home made and fresh. To make the bread crumbs take day old bread, slice it thickly and place into a preheated oven at 40° Celsius for an hour and a half. Once nice and toasted, break the bread up into chunks and place in your food processor. Process until as fine as you can get them. For fine bread crumbs, use a sieve to get the finest grains. I have a left over bag of half coarse and half fine bread crumbs, and I have placed them into the freezer for the next recipe that calls for breadcrumbs. This loaf of bread needs to be started the day before you want to eat it / use it but needs no attention during that time so you could do it after work on a Friday and have fresh bread for Saturday lunch. I did not read Paul’s introduction before making this bread, and even though he states to use 25% less dried yeast to instant yeast, I used the amount he stated, and it worked perfectly. He only uses fresh yeast in his recipes and this can be bought from your local bakery, or the bakery section of your local supermarket. It looks like a lovely soft loaf. I’m surprised it doesn’t have any salt in it though. Beautiful loaf, Tandy! I’m interested to hear how Cordelia goes after her stint in the freezer, I’ve never had much luck with that, but lots of people freeze their starters, so I know it can be done! Lovely looking bread and like someone else mentioned – think you’ll enjoy Pies and Puds when you get it! I am now really looking forward to seeing it! How I wish that bread wasn’t a likely food intolerance for me, Tandy… I’d love to do more bread making in my retirement. 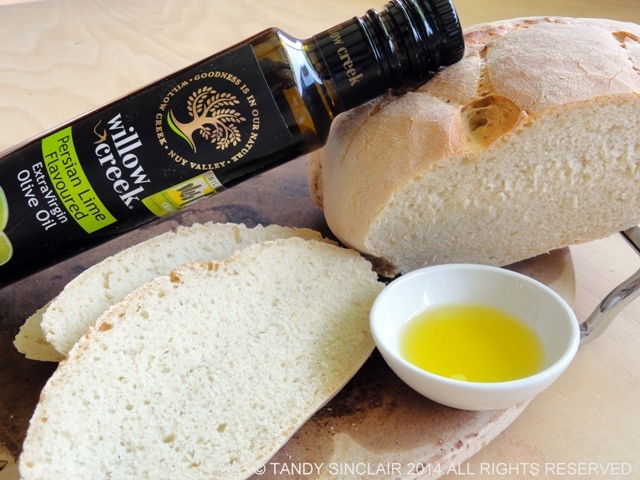 Happy baking… your Tuscan bread looks delicious. I hope that you get to bake many loaves and enjoy them all! What a tasty looking loaf. Hi Tandy, glad you enjoyed watching Paul Hollywood making bread. He has just finished a new series here in the UK called Pies and Puds, also very watchable. Interesting to note though when he was on TV here he always used easybake dried yeast. Find it very hard over here to get fresh yeast, so maybe that is why. One supermarket stocks it, but ten miles away another branch does not – Health and Safety stated, the bane of our lives here. Happy New Year to you.. Wendy. Lovely looking bread. I will be interested to hear how you find the other recipes in Paul’s book as I am tempted to buy it myself. I think that I need to make a resolution that 2014 will be a homemade bread year. I so want to start, but so far I am on buns and easy to make breads.